Remember this Mini I showed a while back? I got it quilted in just two days. by machine of course. Then found out she uses 1 1/4 in. strips. EEK I started to cut them out today. More about that later. Isn't this cute. I have so many strips of all sizes that I have tried to put together so figured this would be easy. I need another project or quilt don't I? Have a busy day in town tomorrow. Wed. is my day to go to the Beauty Parlor. 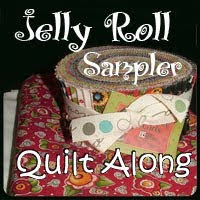 My one thing I do for myself, except quilting of course. But then I have TB Club in the afternoon so guess what ? I get to go to the quilt shop. 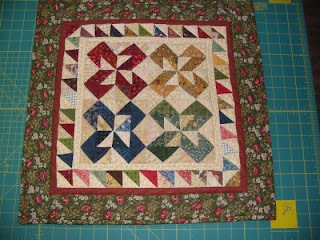 Do have to get some batting for the flannel quilt I have ready to pin. Well, when I get the batting. More about the Log cabin tomorrow. Cute pattern, how many blocks have you made so far? Your little quilt is really cute! 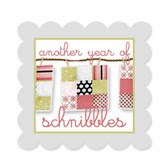 Such a cute block and border too. 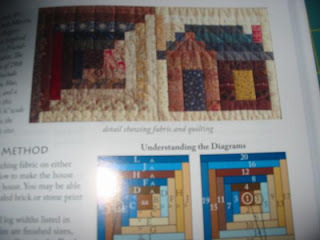 The JM quilt looks really cool and like lots of work! The cabins are very clever, aren't they? Cute little quilt! 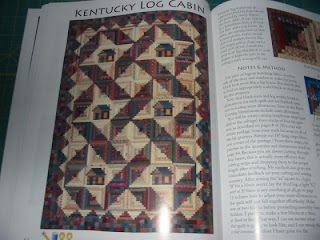 And I can totally understand why you fell in love with that Log Cabin quilt... it is gorgeous!